Great post! I will check out the book. HAVE COURAGE and RESPOND TO CHANGE really resonated with me and my experiences. In addition, Provide Continuous Feedback is something we are really pushing to both our SQA team members and the business users that participate in our demo sessions at the end of each sprint. We have developed some cool technology to allow feedback to be delivered directly from the running application - it is simple to use and eliminates much of the ambiguity found with many techniques for submitting feedback. Check out a demo at www.outsystems.com/demos in the Agile Management section - Embedded Change Technology. The priciple of "self-organize" is a really point. In our organization, we ran into a situation that developers implement/fix bugs in a very fast pace, each sprint, there are more and more feature/bug waiting for QA to verify. Our testing backlog started growing. As a QA member. I am starting feeling a little nervers that we will never be able to keep up. Until one day the team lead realized the situation and implement the whole-team approach. The developers got involved on clearing up the increasing testing backlog items. Then we see the backlog diminishing. 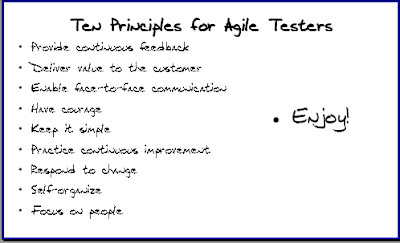 It is such a relief that the practice we had was in line with the agile testing spirits.